A true-life, James Bond-style Cold War mystery. In April 1956, the SovietcruiserOrdzhonikidze came to Britain. It docked in Portsmouth Harbour. On board was Nikita Khrushchev, the First Secretary of the Communist Party of the Soviet Union. He was on a diplomatic mission. Britain’s secret service, MI6, wanted someone to investigate the ship’s propeller. Apparently, it had a new design that they wanted to copy. They asked expert diver Lionel Crabb to check it out. 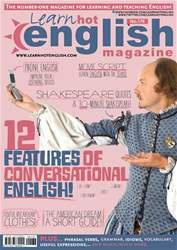 The latest issue of Hot English (176 – the January issue) is out now! Learn over 300 useful words and expressions and improve your listening skills with Learn Hot English! This month: 12 features of conversational English to improve your listening skills, 12 romantic words and expressions, 10 music genres, 12 expressions for describing someone, 6 useful phone expressions, 20 useful clothes words and expressions... plus: • Quiz – How romantic are you? • Film – movie extracts • General knowledge – trivia • Crime – corny criminals • Music – misheard lyrics • Psychology – how to be happy • Travel – cool hotels • Literature – Shakespeare quotes • History – the 1950s • Culture – the American dream • Heath – Nuts! AND LOTS, LOTS MORE! By reading and listening to all this great content, you'll improve your English reading and listening skills and learn up to 300 useful words or expressions. Plus, you'll get a better job and pass English-language exams more easily. Guaranteed! 12 FEATURES OF CONVERSATIONAL ENGLISH!